Foodcapades in oriental grocery stores are awesome. Growing up, it was a tradition that every Saturday morning we would head out to Dragon Centre to purchase fresh fish and items not found in typical grocery stores. I became a pro at telling good fish from bad; checking the gills of the fish to ensure that they were ruby red, observing their eyes for clarity, and poking them to see if their skin was taut and bounced back. However my favourite part of the entire expedition was running up and down the candy/snack aisle. There was so much magic and mystery surrounding the items in this aisle, and the only way to dismiss that curiosity was to try everything. I always got some sort of treat during our expeditions whether it be haw flakes, pocky sticks, tamarind balls, shrimp chips, or preserved prunes (I was a kid with a wild palate). 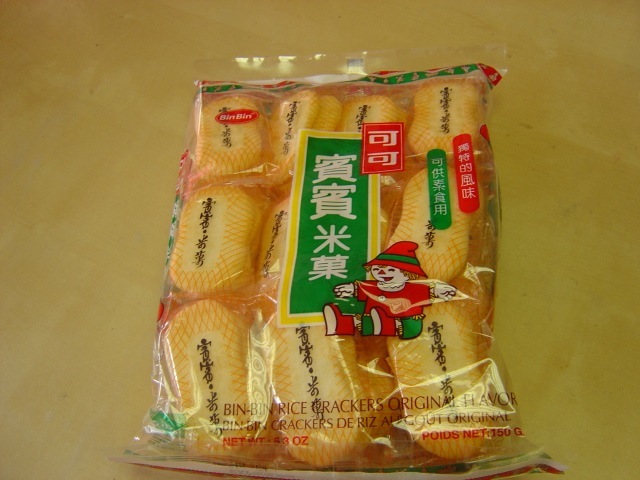 One item that has recently become a household favourite once again are these Bin Bin rice crackers. I used to take these to school with me for recess in elementary school. I rediscovered how addictive these crackers were recently when I found myself replacing my whole grain cereal breakfast with four individual packages of these crackers every morning. Eek…I know. They’re just that good folks! They have a very subtle flavouring of soy, and are the perfect balance between salty, savoury and sweet. Their texture is in between styrofoam and cardboard, but don’t let that turn you off. They are as addictive as snacks can get, and retailing at about $1.50 a package, a perfect snack in this wavering economic climate. Can I interest you in a Bin Bin cracker? Asian of the Day: Vijaya Selvaraju! Haha, I used to love those crackers too! I can’t believe you know how to check if a fish is fresh (I used to do the same with my mom too! ), haha. Checking the gills are key.